Genuine Diversity, Equity and Inclusion (DEI) sustainability depends on both individuals and systems. For an organization to achieve DEI maturity, individuals need to develop self-awareness and build their cross-cultural skills, and on a systems level, DEI needs to be fully integrated into all aspects of the organization from strategic planning to formal policies to informal procedures. 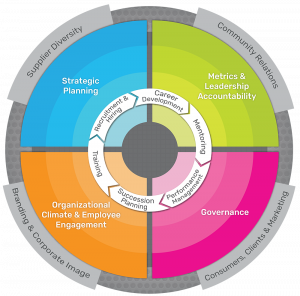 The Inclusive Organization Framework, a cutting-edge diagnostic tool developed by IBIS, gives organizations a clear appraisal of how thoroughly they have embedded Diversity, Equity and Inclusion (DEI) in their policies, procedures, and programs, and what changes are needed to ensure DEI success. Using over 400 best and emerging practices drawn from across all industries, the IOF helps organizations identify what they are doing well to increase DEI, what needs improving, and what additionally they need to do to build their competitive advantage. The 6 workforce systems, represented by the intersecting white arrows, represent the interconnected scaffolding that is critical to building and sustaining a diverse and inclusive organization: Recruitment & Hiring; Career Development; Mentoring; Performance Management; Training; and Succession Planning. The organization’s internal environment is depicted by the wedges, which represent key elements that shape and reflect the organization’s culture: Metrics & Leadership Accountability; Strategic Planning; Governance; and Organizational Climate & Employee Engagement. The interface between the organization and its external context is shown by the outermost ring: Branding & Corporate Image; Consumers, Clients & Marketing; Community Relations; and Supplier Diversity. Different levels of D&I maturity are represented through the concentric circles, with Level 0 –the most basic level – at the center. Radiating outward, each level expands and builds on the smaller circle(s) it encompasses. Stakeholders from the 14 key organizational areas access IBIS’s online IOF questionnaire, which uses over 400 DEI best practices to assess their policies, programs, and practices. In addition to the basic online assessment in Option 1, IBIS performs a thorough analysis of representative documents, policies, and programs; interviews senior leaders and key stakeholders; conducts focus groups across demographics; and administers an online employee DEI perception survey. While all phases of our engagement with IBIS so far have been exceptional, we have been especially impressed with the data gathering and analysis aspects. Through interviews, focus groups and a comprehensive survey, IBIS was able to gather a treasure-trove of information. We gained significant insights from the data. This has provided us with an extremely strong foundation from which we can confidently base our decisions to further our Diversity and Inclusion initiative.